Topps introduced us to Clearly Authentic last year. 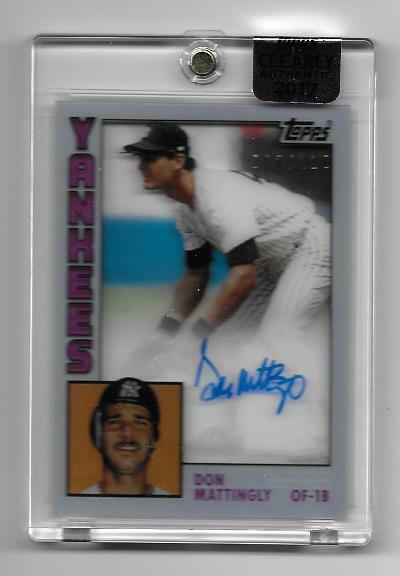 It quickly became one of my favorite new products, especially after pulling a Don Mattingly Rookie Reprint Auto. Classic designs, on-card autographs, and acetate card stock can make for some interesting finds. Housed inside every box of Clearly Authentic is (1) autographed card. Boxes sell for $50-$60. For the most part, the card you pull will feature the 2018 Topps flagship design along with a new image of that specific player. Parallels of these include Green #’ed/99, Black #’ed/75, Red #’ed/50, Blue #’ed/25, Purple #’ed/10, Orange #’ed/5, and Gold #’ed 1/1. Outside of the flagship design are Salute and MLB Awards. Both of these have the same parallels as the base – Green #’ed/99, Black #’ed/75, Red #’ed/50, Blue #’ed/25, Purple #’ed/10, Orange #’ed/5, and Gold #’ed 1/1. Case hits include 1993 Finest Stars, Reprints, and Legendary autographs. All vary in serial numbering, but each have a Gold parallel #’ed 1/1. The Reprints have really caught the eye of collectors, and are my personal favorite cards that you can pull. I’ve noticed that boxes containing redemptions come with (2) autographs. That certainly is a nice bonus. Too many people bash products because what they pull might not get all of their money back. You’re not thinking correctly if that’s all you want to do. For some, picking up singles on the secondary market might work better. Either way lots of collectors can enjoy this product.